* A customizable interface framework for supporting custom, movable button bars. * See the in-game options screen under Interface-&gt;Addons for command line support. * Show/Hide bars with 1-click toggle buttons. 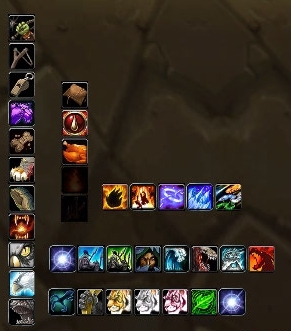 * XCompanionBar - Shows non-combat pets and mounts. * dtylerb and Ravenswing for making and keeping XPortalBar a success. See xportalsbar\readme.txt. * A HUGE thanks to all of those in the WoW community that have helped to make these previous mods a success, and to those who convinced me to keep these things going. * See readme.txt in each addon folder for additional information about included features for that specific addon. If there is no file, either the author didn't explain it fully or there are no addon-specific features that are not self explanatory or generic to XBar. * See FAQ.txt for additional info on how to use the advanced features of XBar and troubleshoot issues before posting a question or issue here.